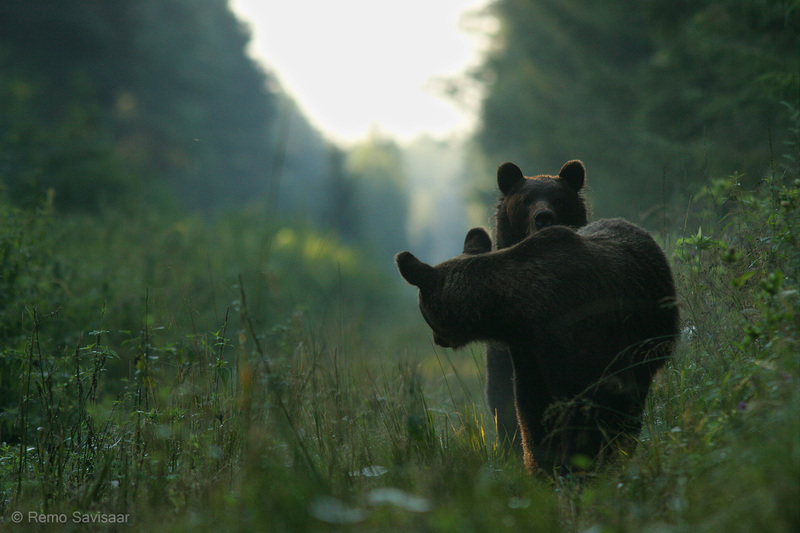 Young bears in August on a forest sighting line. Curious! My first encounter with a lynx took place 9 years ago, in the beginning of September. At that time I visited the Alam-Pedja nature conservation area quite often. At the time it seemed like paradise to me. I cannot remember a single empty visit, and each time excitement was sky-high. Whom will I meet today? I always saw some interesting mammal or winged creature. Roe deer, elks, foxes, raccoon dogs. I didn’t dare to dream much about larger creatures but I did think of lynxes. There were tracks and there was hope! One early August morning, moving along a meadow and then along forest sighting lines and clearings in the forest I managed to meet elk calves and after that their mother too. After observing and photographing them I headed quietly into the neighbouring forest, to get from there to the next sighting line from the road. When I reached the next forest road it seemed empty. For certainty I checked the sighting line in both directions through the camera sight and saw then at about 300 meters someone in action. I guessed that it was a wild boar because the animal was large and dark-coloured. Approaching however it quickly turned out whom I had to do with. It was a bear! My first bear! And as it turned out a few moments later they were even two! I was elated because I had for a long time been dreaming about meeting a bear in nature. To see a bear, lynx or wolf in nature is a great thing. I have walked many kilometres along fresh bear, wolf or lynx tracks without seeing them. I took some photos from a distance and wondered whether they would remain my best bear images. With trembling hands I started quickly to erase old images because the 2GB memory card was filled with elk photos. I couldn’t blame myself enough for having forgotten the extra memory card in the car. It was always in the pocket of my jacket but just now when it was needed I had forgotten it in the car. I took some more photos. The bears were very small in the photos. I decided to try to get a little closer. A bear is a quite shy animal and runs off at once when the smell of a human hits its nose, not to talk about seeing a human. I tried to use my time and started to creep closer super silently. The wind was favourable. About half an hour later I was 40 meters away from the position where the honeypaws just had turned off. I stayed waiting and hoped that the bears maybe would turn up once more and get out from the same spot. A minute … five… ten … went by … and they came! Unbelievable! Direction straight towards me. At some time the second bear also crawled out whereupon the first one stopped, looked at the second one and stayed waiting for it. After having waited for its companion they approached some more steps. The next moment finally the rear bear became aware of the fact that on the road there was a suspicious crouching shape. Although it passed my mind that if these are young bears do they then have their mother nearby? And if so, then where? A tiny sense of fright entered because as with elks it is very dangerous to come between a mother bear and its cubs..
To see me better the bear at the back rose up on two legs, so changing into a quite a boulder. I photographed but the bear did not fit in the frame. I turned the camera into portrait format and saw how the upright-standing honeypaw took off to the right . After that the bear that had been standing on four legs rose up. All kinds of thoughts already tumbled in my head. The bear let itself down and took a few more steps closer, just passing my endurance limit. Finally it too followed the companion. I felt relieved. The departure of the bears was quick and the forest crackled as if trees were being broken there. We were not far from a point when I would have been forced to decide for myself how to act. Probably I would have talked to the first bear and if the bear would still have been there after that, I would have used an angrier voice, standing up and making myself bigger. All ended well and peacefullly. I was extremely happy and filled with powerful emotions. Such a morning I would never have expected. After this encounter I went there many mornings looking for another meeting. A month later I was at the same felling line and observed the doings of a roe deer there until it disappeared into the forest. I moved quietly closer to the spot and stopped, somehow it felt as if someone more was there and observed me?! I lifted the camera and checked through the lens. Wow! It was a lynx! I froze into immobility and watched the wild feline through the lens. I had already been discovered by the lynx and did not even have time to think about approaching before the lynx disappeared from the clearing into the forest. I quickly checked the images on the camera display – had I managed to catch the meeting? And there it was – my first lynx!